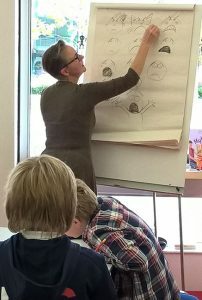 Sharing my hot-tips, to help children’s drawings come to life! Suitable for: 7 – 14 year olds (an adult adaptation is also available). I talk about what it’s like to be a children’s book illustrator and briefly explain how an illustrator, author and publisher work together to create a picture book. 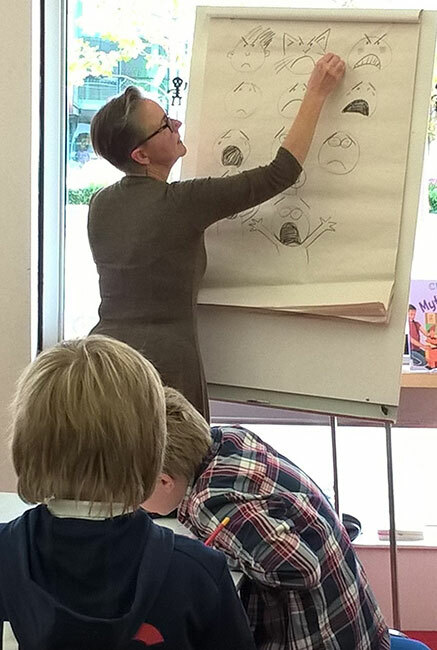 I then demonstrate simple but effective techniques for drawing a range of characters, while the children draw along with me. We learn how to use facial expressions and body language to bring them to life and, with time, we learn how to add movement. I need at least 1 large table, an adult height flipchart, with flipchart pad, blutack and sellotape. Children need lots of A3 white paper, pencils and sharpeners. We try to avoid use of rubbers. Children need to watch me as they draw, so please ensure nobody has their back to me and tables are as close to the flipchart as is practical. With slightly older children, the above workshop can be extended to a half day or full day. In the extra time, we can look at easy ways to add backgrounds; techniques for adding colour and shading to our drawings; or ways for using illustrations as a starting point for children to spin possible storylines. With the use of a visualiser, I can demonstrate colouring techniques. If we have a full day, it helps to start with the PowerPoint talk as an introduction. Suitable for: 9 years – adult. Duration: 3 hours – full day . Numbers: maximum of 15 .